Around 829,000 people work in D.C. (within the city-proper), and about 26 percent of them are immigrants. Today, the Washington Post reports that some of D.C.’s immigrant workers, particularly those working in restaurants and some daycare centers and schools, are going on strike. Most of the occupations with the highest concentrations of immigrants in D.C. are those with low or middle wages. However, immigrants comprise almost half of D.C. workers in several high-wage occupations: economists (46 percent), mathematicians and statisticians (43 percent), and physical scientists (42 percent). We define a job as low-wage if its median wage was in the bottom 25 percent of median wages across all jobs in D.C (or below $44,000). High-wage jobs have median wages in the top 25 percent (or above $86,000) and middle-wage jobs are in between. While low-wage jobs in D.C. have the highest concentration of immigrants (41 percent of all low-wage workers in D.C. are immigrants, compared to 22% of middle- and high-wage workers), the number of immigrants in low-wage jobs in the city is roughly equal to the number of immigrants in high-wage jobs, since the city has many more high-wage workers. There are about 75,000 immigrants in low-wage jobs in D.C. and about 73,000 immigrants in high-wage jobs. Our data on immigrants by occupation comes from the 2015 American Community Survey 1-year PUMS data. “Immigrants” include naturalized U.S. citizens and non-citizens. “D.C. workers” are people who live in D.C., Maryland, and Virginia who report D.C. as their place of work. We only look at occupations with more than 3,000 people working in D.C. in order to reduce sampling errors. Because the ACS is based on a sample, there is a margin of error in all of our calculations. Our calculations should be treated as estimates, not precise counts. Our wage data comes from the May 2015 Bureau of Labor Statistics Occupational Employment Statistics Survey. We define a job as low-wage if its median wage was in the bottom 25 percent of median wages across all jobs in D.C (or below $44,000). High-wage jobs have median wages in the top 25 percent (or above $86,000) and middle-wage jobs are in between. In cases where the occupation code in the ACS data did not match the occupation code in the BLS data, we calculated a median wage using the ACS data. Nearly 800,000 people work in the District of Columbia, yet only about 30 percent of the District’s workers live in the city-proper. Workers in low-wage jobs are more likely to live in the city than those in middle- and high-wage jobs. Thirty-nine percent of D.C.’s workers in low-wage jobs lived in the city between 2010 and 2014, compared to 30 percent in middle-wage jobs and 27 percent in high-wage jobs. You can see how this plays out by occupation in the graph below. Cashiers, janitors, childcare workers and others in low-wage jobs are more likely to live in the city than most other workers, though people in a handful of middle- and high-wage occupations, like managers of social and community services, teachers, and chief executives, have relatively high rates of living in the city too. Registered nurses and police officers (which include transit and federal police) are the least likely to live in the city. People in low-wage jobs tend to live in the city more than others, but that’s been changing over the past decade, as you can see in the chart below. The city is losing construction workers, cashiers, childcare workers, and janitors, and gaining people in high-wage jobs, like managers of social and community services, operations research and management analysts, and economists. In less than a decade, the workers most likely to live in the city shifted from cashiers, retail salespersons and clerks (50 percent lived in the city in 2005-2009) to managers of social and community services (47 percent lived in 2010-2014). Meanwhile, over the same time period, the least likely to live in the city switched from software developers (9 percent in 2005-2009) to police officers (11 percent in 2010-2104). As the graph below shows, this is part of a larger pattern of D.C. workers in middle- and high-wage jobs starting to show a preference for living in the city, and workers in low-wage jobs increasingly living in the suburbs – a trend that’s unsurprising given the District’s increasing cost of housing. The percent of workers in low-wage jobs living in the city decreased from 43 percent to 39 percent between 2005-2009 and 2010-2014, while the percent of workers in high-wage jobs living in the city increased from 24 percent to 27 percent over the same time period. These changes may seem small, but they are statistically significant at the 99 percent confidence level. Wage data: Our wage data comes from the Bureau of Labor Statistics Occupational Employment Statistics survey of D.C. workers from May 2015. We define a job as low-wage if its annual median wage was in the bottom 25 percent of annual median wages across all jobs in D.C (or below $44,000). High-wage jobs have annual median wages in the top 25 percent (or above $86,000) and middle-wage jobs are in between. Percent of Workers Living in the City: Our data comes from the American Community Survey PUMS data for 2005-2009 and 2010-2104. For our universe of D.C. workers we started with everyone living in D.C., Maryland, or Virginia who works in D.C., so we are excluding long-distance commuters who work in D.C. but live in places outside of D.C., Maryland, and Virginia. When we analyzed specific occupations, we looked at all occupations with 8,000 or more workers in D.C., with the exception of miscellaneous managers since the category is vague. We grouped some occupations together so they surpassed our 8,000 person threshold. Map of Where Workers Live: This data comes from the American Community Survey PUMS data for 2014. We only look at workers who work in D.C. and live in either D.C., Maryland, and Virginia. All of the occupation groups in the map have 8,000 or more people working in the city. Police Officers: Police officers in this case includes more than just people employed by the Metropolitan Police Department; it also includes transit police, federal police, and police who said they work for private organizations. In 2014, the Metropolitan Police Department released data showing 17 percent of its officers live in the District. Errors: The data in this post have various margins of error since the data comes from surveys. In most cases we used a five-year data set to reduce the errors, and only looked at occupations with 8,000 people or more. The errors are highest for the map of where people live because for that we had to use a one-year dataset (geographic boundaries changed within the five-year dataset, making a map more difficult to produce). The map is intended to give readers a general sense of where people live; we discourage people from using it for direct area-to-area comparisons. Our findings on the loss and gain of workers of different occupations and wage levels are in many cases statistically significant and we have noted this in the post. What’s a Typical Income in D.C.? It Depends on Your Peer Group. The median income for a household in D.C. is about $73,000, but household incomes vary widely depending on the type of household you live in. The households with the highest incomes are those headed by married couples. Married people with children at home have a median household income of $161,000, and married people not living with children have a median household income of $136,000. The lowest-income households tend to be those headed by an unmarried person with children. Among these households, the median income is $36,000. These extremes in income don’t appear to be influenced much by household size once there’s more than one person in the household; 2-, 3-, and 4-person households in the city all have median incomes between roughly $90,000 and $100,000. The large differences in income are likely due to a number factors, like number of earners in a household; higher incomes for people farther along in their careers; and higher marriage rates for people with college degrees, who are likely to earn more money than those without a college education. We analyzed the 1-year American Community Survey Public Use Microdata Sample (PUMS) for 2014. We converted all incomes into inflation-adjusted 2014 dollars. Married with kids: Married couple with children present in the household. Married no kids: Married couple with no children present in the household. Two or more unmarried adults living together: Un-married householder living with other adults; no children present. People in household can be related. Living alone: Adult living alone; no children present. Unmarried with kids: Un-married householder with children present in the household. Other adults may be present in the household too. Can school lotteries make schools more diverse? Last year, 48 percent of students attending D.C. Public Schools were at-risk, meaning they were homeless, in foster care, qualified for food stamps or TANF, or were high school students who’d been held back a grade. The share of at-risk students in a DCPS school varies greatly, from 1 percent to 90 percent. DCPS students are assigned to a neighborhood school but school mobility is high. In 2012, 43 percent of DCPS students attended their assigned neighborhood school. For charters, though, there are no attendance areas. So we wondered: can charter schools, which base admissions entirely on a lottery instead of a student’s address, better mix at-risk students than DCPS and create more egalitarian schools? Our answer is a qualified no. Though charters last year enrolled about the same percentage of at-risk students as DCPS (44 percent), most charters (47 out of 53 elementary and elementary/middle schools) have lower concentrations of at-risk students than nearby DCPS schools serving similar grades—and by nearby, we mean within the same DCPS elementary zone. The difference in concentrations of at-risk students between charters and DCPS is greatest in areas of the city where high numbers of at-risk students go to school. For DCPS schools where 75 percent or more students are at risk, the at-risk population in nearby charters is lower by at least 10 percentage points. In areas where DCPS schools have smaller at-risk populations, some nearby charters have at-risk populations closer to those of DCPS, while others have some of the lowest concentrations of at-risk students in the city. Charters tend not to locate near DCPS schools with the lowest concentrations of at-risk students. We found similar results when we plotted the percent of at-risk students in a school versus neighborhood home prices. In neighborhoods with the lowest home prices, charters have considerably smaller portions of at-risk students than DCPS schools. As home prices increase, there are charters that have at-risk populations more similar to those of DCPS schools, though other charters in these areas have very small at-risk populations. There are few charters in the areas with the highest home prices. What does this look like across the city? The map below shows that the concentration of at-risk students in both DCPS and charters generally increases as you move from northwest to southeast (and here we show all schools, not just elementary and elementary/middle schools). West of Rock Creek Park, where the DCPS schools with the lowest concentration of at-risk students are located, there are no charter schools, and the charters with the lowest concentrations of at-risk students are located in the center of the city. East of the Anacostia River, charter schools tend to have lower concentrations of at-risk students than DCPS schools. Put another way, both DCPS and charters have some of the least economically diverse schools in the city—they’re just located in different parts of the city. The map below gives you another way to see what’s going on in different parts of the city by comparing charters and DCPS side-by-side. The map is interactive and it lets you zoom in on different neighborhoods and filter schools by the size of their at-risk populations. One thing that strikes us in the map is the marked difference in at-risk populations in charters and DCPS schools east of the Anacostia River. Since only two charter schools east of the river had more than 25 percent of their students cross the river to go to school last year, it seems likely that charters here attract non-at-risk students from neighborhood DCPS schools or keep non-at-risk students in the public school system who would have otherwise left for private schools or moved. The map below also shows that in the north and northeast parts of the city, plenty of charters have at-risk populations similar to those of DCPS schools, while other charters have much smaller at-risk populations. We’re curious to hear what you conclude from these graphics and what patterns you see that we may have missed. students enrolled in alternative education programs. School locations are from the Friends of Choice in Urban Schools. We define a charter’s “nearby” DCPS school as the DCPS elementary school for which a charter’s location is zoned in the 2015-2016 school year. The boundaries for the DCPS elementary school zones are from the Office of the Chief Technology Officer. We have excluded from our analysis schools that serve alternative, special education, and adult populations. Three charter schools in the graphics above closed after the 2014-2015 school year: CAPCS, Tree of Life, and Options. Thank you to Yesim Taylor for her comments on this post. Last week the Mayor held a press conference to address an increase in violence in the city. While the total number of crimes committed so far this year is about the same as by this time last year, some violent crimes have increased. By our count, the number of crimes committed with a gun this year is 20 percent higher than last year. So what’s behind this surge in gun violence? The crime data we looked at, which is available to the public through the D.C. Data Catalog, revealed some interesting patterns. First, as many people have speculated, the increase in gun violence this year has been driven by crime this summer. Nearly half of the increase in crimes committed with guns this year is from an increase in gun crimes this June and July. The number of gun crimes this summer is also higher than in the summers of 2012 and 2013, even though in those years the total number of gun crimes was about the same as this year. We also found that gun violence has not increased uniformly across the city. Out of the 39 neighborhood clusters for which the police department reports crime data, 22 saw an increase in the number of crimes committed with guns this year. The biggest increases were in a few neighborhood clusters: north-central clusters like Petworth/Brightwood Park/Crestwood and Takoma/Brightwood/Manor Park; eastern neighborhood clusters west of the Anacostia River like NOMA/H Street/Capitol Hill and Capitol Hill/Lincoln Park; clusters near the southern tip of the city, like Congress Heights/Bellevue/Washington Highlands; and other southeast neighborhood clusters east of the Anacostia, like Woodland/Fort Stanton/Garfield Heights/Knox Hill. Seventeen of the neighborhood clusters saw a decrease or no change in crimes committed with guns this year compared to last year. The biggest decrease in gun crimes occurred in neighborhoods in the eastern corner of the city. Several of these neighborhoods, though, still had gun crime numbers that were among the highest in the city. It’s still unclear why this surge in violence is happening. Some people believe it’s from synthetic drugs or part of a nationwide trend. We’re curious to see if anyone can find more answers using data. 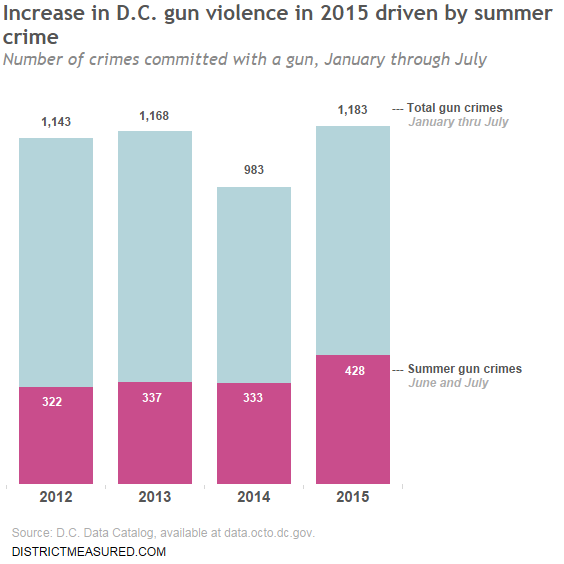 We downloaded the crime data from the D.C. Data Catalog on August 4, 2015. Because the data is updated periodically, numbers pulled later might differ slightly from the numbers we have in our post. We looked at all crimes in D.C. reported between January 1, 2012 and July 31, 2015 where the method listed for the crime was “gun”. In most parts of the District, people who wish to buy a home face an expensive housing market. The costs become even higher if you want to buy within the boundaries of a high performing public school so your children have the right to attend that school. We found that a typical three-bedroom home in the attendance zone of a DCPS elementary school with the very top test scores – places where 80 percent or more students are proficient or advanced in reading – will cost over $800,000, and that is just the median price and does not incorporate post-purchase improvements to homes. In DCPS elementary school zones where 60 to 80 percent of students are proficient or advanced in reading, the median sale price of a three-bedroom home ranges from the high $600,000’s to over $1 million. Not until you look at schools where 45 to 60 percent of students are proficient or advanced in reading will you find a wide range of median home prices, including several below $650,000. The graph below shows the median sale prices of all three-bedroom homes sold in the District during the past year, grouped by the new DCPS elementary school attendance zones that go into effect this fall. We plot them against the reading test scores in each school attendance zone. As you can see, home prices tend to be higher in attendance zones with higher test scores. The maps below show two different ways to sift through this data, one that begins with the buyer’s budget and the other one with the school’s performance. You can find some relative deals, and also again see the constraints on families who are not high income. The first map shows elementary school performance for a given price range, summarized in five tiers based on each school’s test scores and growth in test scores. The school tiers we use are from the Office of the State Superintendent; you can read more about the performance tiers here. If you filter the map to show places where median home prices are below $500,000, you’ll see that only elementary school zones on the eastern edge of the city fit this criterion. These schools mostly fall into the three lowest performance tiers of five, though a handful schools (Leckie, Nalle, Burroughs, Barnard, Truesdell) fall into tier two, the second highest performance tier. The second map shows the range of median home prices in each school performance tier. For example, if you filter the map to see tier-2 schools, you’ll see that median home prices range greatly, from $150,500 in Leckie to $1.4 million in School Without Walls at Francis-Stevens. The map also shows that for a tier-1 school you’re looking at a minimum median home sale price of more than $750,000. How do families who can’t afford top home prices navigate the educational landscape in D.C.? Around 44 percent of the District’s public school students attend a public charter school. Students earn the right to attend a charter school through a lottery; where they live is not a factor. Out of the public school students who attend a DCPS school, 40 percent attended a school outside of their zone in 2012. Some of these students entered out-of-boundary schools through a lottery, while others had the right to attend more than one school. Once the new school boundary system is completely phased in, DCPS students will have the right to attend only their in-bounds school. Also, plenty of students live in homes with fewer than three bedrooms (our unit of analysis) and have parents who rent instead of own their homes. This could help defray the costs of living in the boundaries of top-performing schools. Median sale prices are for 3-bedroom homes sold in D.C. in the past year (July 2014 – June 2015). Home sales data is from MRIS and was provided by realtor Kevin Wood via popville.com. We used the new DCPS elementary school boundaries that will be phased in starting in the 2015-2016 school year. Children who are assigned to new schools under the new boundaries will be able to stay in their current schools. The boundaries are from the D.C. Office of the Chief Technology Officer. School tiers are how the Office of the State Superintendent of Education (OSSE) ranks schools by performance for federal reporting and accountability purposes. You can read more about the performance tiers here. In our post we numbered the tiers, but OSSE instead uses the terms “Reward, Rising, Developing, Focus, and Priority”. We used the tiers OSSE assigned schools in 2014. Reading scores are from the 2014 D.C. CAS. The portion of public school students attending charter schools is from 2014. This data is from OSSE. The percent of DCPS students attending out-of-boundary schools is from data from the Deputy Mayor for Education, which you can access here and read about here. Correction: In a previous version of this post we said that 71 percent of DCPS students attended a school outside of their assigned zone in 2012. In fact, 40 percent of DCPS students attended out-of-boundary schools in 2012. The initial version of this post also said all of these students entered these schools via lottery, but under the old boundary system some of these students had the right to attend these schools.